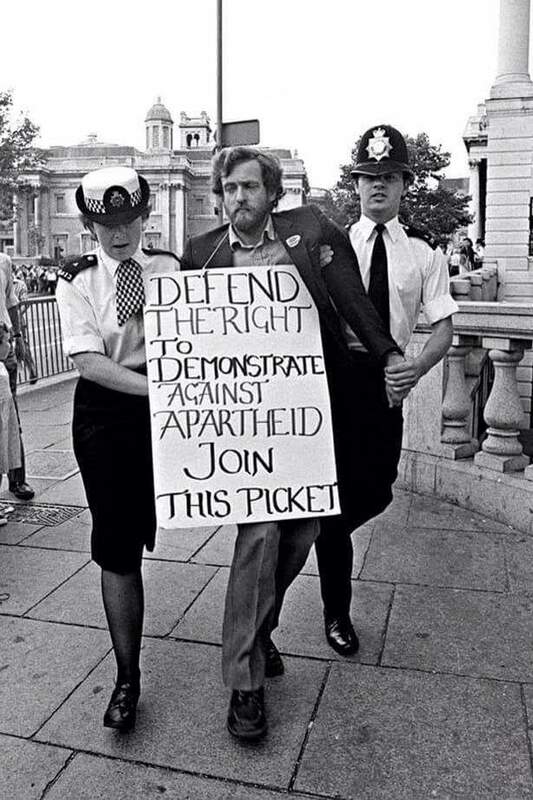 At a Time when Margaret Thatcher was calling Nelson Mandela a terrorist, and a young David Cameron was living it up on all expenses paid tours around apartheid South Africa, Jeremy Corbyn was being roughed up and arrested for blockading the South African embassy in London. Is this a photo of Jeremy Corbyn, and is it photoshopped in any way? Was he arrested, and if so was it for blockading the South African embassy? Did this happen at a time when David Cameron was touring South Africa, and was Margaret Thatcher the Prime Minister then? Yes, photo and caption are essentially accurate. Some details are not entirely accurate: the arrest was in 1984, the Thatcher quote in 1987, and Cameron's trip in 1989. And although Thatcher labelled the ANC as terrorist, she also pressed the South African president to release Mandela. See below for details. The photo shows Corbyn under arrest. It is probably difficult to objectively determine whether he was “roughed up”, as this term is rather vague. It appears he did not leave voluntarily, and that the police used force to remove him from the protest. This may or may not be considered “roughed up”. In this interview, she was talking about the ANC in general, and not about Nelson Mandela specifically. 3 years prior, in 1984, she reportedly harangued [the South African President] on why he should let Mandela out of prison. I will leave open the interpretation of those two observations (I'm not sure how to interpret it myself). Note that this was 5 years later than Corbyn's arrest, so Cameron was not in South Africa at the exact moment of Corbyn's arrest (or at least not on the funded trip), but both happened during the "Thatcher era" of British politics, so it depends on ones interpretation of "at a time" whether one considers this true or partly true. Not the answer you're looking for? Browse other questions tagged politics united-kingdom .